Year after year, the Honda Accord delivers the exceptional blend of performance, functionality, and reliability that Mechanicstown drivers have come to expect. Few vehicles have offered such consistent levels of quality. The new 2014 Honda Accord is not drastically different from the 2013 Honda Accord, but it does come with enough updates to feel like its own car. At Middletown Honda, we’re happy to offer this quick guide to help you compare both models. 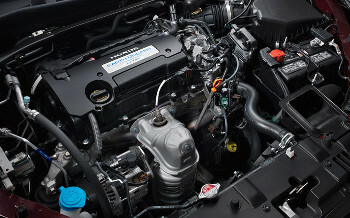 The 2014 Honda Accord has the same four-cylinder and V6 engine options, and delivers similarly exceptional fuel economy. The 2013 Honda Accord was a completely redesigned vehicle, which is part of the reason it is packed with features and options, and most of the reason that the 2014 model is so similar. The base trim of the 2013 Accord came standard with 16-inch alloy wheels, dual-zone automatic climate control, full power accessories, cruise control, an eight-inch video display, Bluetooth connectivity, a rearview camera, cruise control, and a four-speaker sound system with a CD player, an auxiliary audio jack, iPod/USB audio interface, and Pandora functionality. Higher trim levels offered larger wheels, heated mirrors, a rear spoiler, and other enhancements. 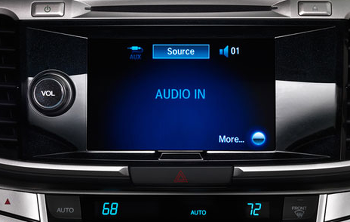 All of these features and options are available in the 2014 Honda Accord, and the trim levels are essentially unchanged. In fact, the only new feature is an enhanced auto-dimming rearview mirror that provides maximum visibility even when the light in the cabin is not optimal. Otherwise, Mechanicstown drivers can find some of today’s best automotive technologies, and choose a trim that emphasizes affordability, sportiness, or premium features. 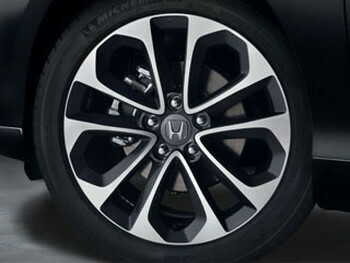 The look of the Honda Accord was one of the biggest changes for the 2013 model year. The size of the car was slightly smaller without decreasing cabin room. The interior materials were also enhanced, and the overall look of the car was less bulky than the model that it replaced. The only major change for the 2014 Honda Accord is the addition of premium seat fabric to the LX trim level. This fabric is more comfortable and better able to resist heat and cold. Otherwise, the two models look very similar, with only minor differences in the dimensions and lines. If you saw them side by side on our lot in Middletown and couldn’t tell them apart, you wouldn’t be the only one. Both the 2013 and 2014 Accord come standard with anti-lock disc brakes, stability and traction control, active front head restraints, front seat side airbags, and side curtain airbags. A rearview camera is also included on all trims. Features like blind-spot monitoring, a lane-departure warning system, and a forward-collision warning system are available on the higher level trims. In NHTSA crash tests, both models earned a perfect five out of five stars for overall protection. Both models also earned scores of “Good” from the IIHS in its small-overlap frontal-offset, side-impact, and roof-strength tests. The 2014 model hasn’t received any safety updates, mostly because the one that came before it was so safe already. You can’t go wrong with the 2013 or 2014 Honda Accord. When the 2013 model was released, it got a lot of praise from critics and a lot of attention from drivers in Mechanicstown and elsewhere. Honda knows it built a great car, which is why they didn’t try to change much for the 2014 model year. To see both models and test drive them yourself, visit Middletown Honda today.